to see photos of dogs and cats wearing this sweater. 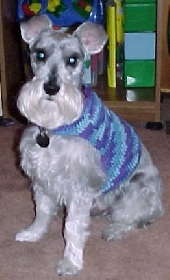 I designed this sweater for my Miniature Schnauzer, Schotzi. is all the way across the sweater rubs and knots his hair up on his chest. Photo courtesy of Angie Wilson. These are her two cats. This is Tim and Lil. Photo courtesy of their owner, Linda Fleisch. Basil - Photo courtesy of Iris. Note: I have not tested this pattern personally but others have made it and say it works up nicely. Please email me if you find any errors. Thank You. 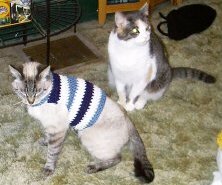 SWEATER SIZE: Approximately 8" from neck to waist. Yarn: 2-3 ounces of any 4ply worsted weight yarn. RND 1: Chain 70, join with sl st being careful not to twist the chain. Ch 2, hdc in next ch and in each ch around. Join with sl st in top of beg ch 2. Ch 2. DO NOT TURN. RND 2-12: Hdc in next st and in each st around. Join with sl st in top of beg ch 2. Ch 2. DO NOT TURN. RND 13: Sl st in the next 20 sts. Ch 2, hdc in next 39 sts (40 hdcs including beg ch 2). Ch 2, TURN. ROWS 14-20: Hdc in each hdc, ch 2, TURN. RND 21: Hdc in each hdc, ch 16, DO NOT TURN. Join with sl st to opposite side of row just completed. RND 22: Hdc in each st and ch around. Join with sl st in top of beg ch 2. Ch 2, DO NOT TURN. RNDS 23-24: Repeat rnd 22. 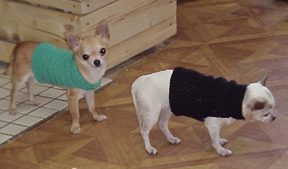 This dog sweater pattern can be easily altered to fit your little one. It begins around the waist. You should chain enough chains to go around your dogs waist. Then join the chain. Finish RND 1. You should do only the number of rounds it takes (in place of rnd 2-12) to go up to just behind your dogs front legs. Then for rnd 13 do sl sts (remember how many for rnd 21) for how wide the dog's chest is (from the outside of one leg to the outside of the other) and then hdc in each remaining stitch. (rows 14-20) You begin working hdcs back and forth in rows). Do ever how many rows it takes to reach above your dog's legs...by the base of the dog's neck. (rnd 21) hdc in each hdc and then where it says ch 16 you should chain the same number as you did sl sts in rnd 13. Then finish the rnd. complete rnd 22, 23 & 24 and finish off. I've gone over this pattern pretty quickly but Linda (whose little cuties are pictured above) was nice enough to test this for me and she said it works out pretty well with my adjusted directions... so I hope I'm explaining how to reduce this pattern well enough for you to make them for your babies. It's really a simple pattern. Kind of plain, but you can dress it up by using different colors on certain rows or something. You could even add a pocket (not that the dog would use it) or some other type of decorative applique. Let me know if you're successful in interpreting my altered directions and if you have a photo of your cuties that you'd like displayed just email me. Round 13 doesn't total 70 stitches because all the stitches aren't actually used. You slip stitch in 20, then half double in 40 and the other 10 stitches are left unworked. I did that to keep the "join" line in the rounds underneath the dog.